Preheated oven to 375°F (190°C). Line or grease muffin trays. In a separate large bowl, whisk sugar with the eggs, milk, buttermilk or yogurt, lemon zest and vanilla. Fold in melted butter or coconut oil. 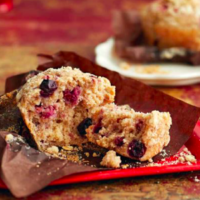 Fold in wild blueberries and raspberries and portion into muffin trays, filling three-quarters full. Bake for 20 minutes or until a cake tester comes out clean. Let cool 5 minutes then transfer to a cooling rack.